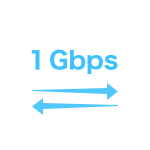 ※ The same rate applies for connecting two facilities or three. 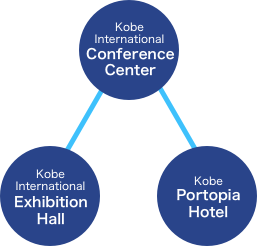 Kobe International Exhibition Hall and Kobe Portopia Hotel are connected with Kobe International Conference Center at the center via dedicated 1Gbps optical lines. We will respond to your various requests, using the strong communications network of the three facilities. You can use the same Wi-Fi settings (SSID/password) in the Conference Center and the Exhibition Hall. Moreover, it is possible to keep connected even in the corridors connecting the facilities. 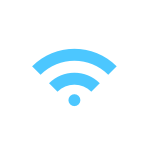 It is possible to offer a comfortable and stable communications environment, as multiple wireless access points with high processing capability, each capable of connecting 240 wireless devices, have been installed. Two dedicated 1Gbps optical lines have been installed respectively in the Conference Center and Exhibition Hall, which has resulted in a stable communications environment. Moreover, a backup line has been established, using the dedicated line to NTT West’s Kobe Data Center. It is necessary to hold a pre-meeting to discuss the details of the usage, if you are going to use the network of Kobe International Conference Center and Exhibition Hall. 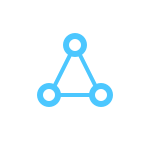 Moreover, the organizer is required to pay the various setup, maintenance, and Internet connection charges. Please view the Equipment and Fixtures page for the communications equipment-related charges, etc. Please contact below for details.